Born in 1940, Régis Debray is a French writer, philosopher and playwright. He holds the title of an ardent Republican, defender of secularism and of the teaching of religion in school. The magazine L'Express recently wrote about him that he remains one of the last great generalist intellectuals of his generation. Fabrice Hadjadj (born in 1971) is a French writer, philosopher, professor and playwright. Born into a Jewish family, Fabrice Hadjadj was an atheist and anarchist as a teenager, then suddenly converted to Catholicism. The phrase that distinguishes him is that of a "Jewish with Arabic name and Catholic faith." 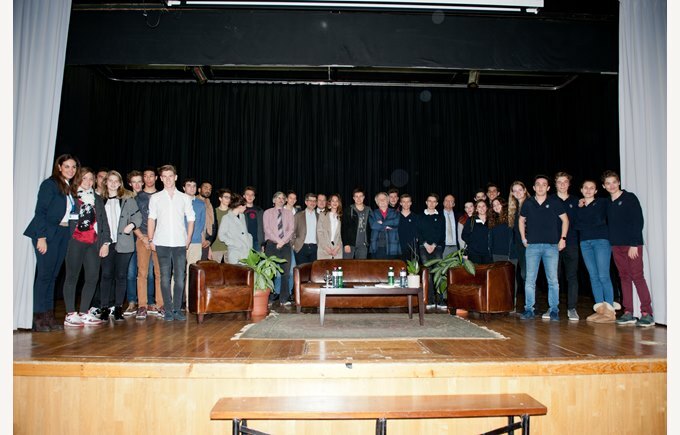 During their encounter at Collège Champittet, these two iconic figures addressed the issues of secularism and school, before answering questions from the audience and those of Maria Zufferey, as part of a personalised interview. Regarding the first theme, Fabrice Hadjadj says the French government forgets that secularism is not a universal concept, a misunderstanding that should be clarified with Islam. Régis Debray responds by explaining that France is going through a crisis of meaning and that a secular state is a state that offers nothing, leaving its people find meaning in their lives individually. 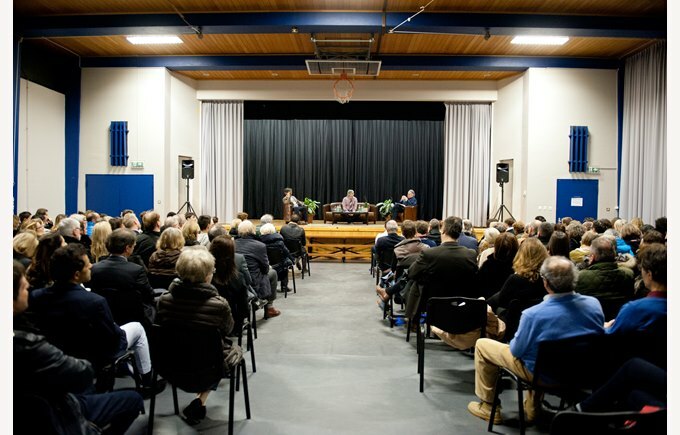 As for the discussion regarding school, Regis Debray denounces the collapse of values and frame, the lost sacredness, the decline of the master's authority and knowledge becoming an opinion: the distinction between knowing and believing has faded away. Fabrice Hadjadj replicates that he sees a paradox there because knowledge is not always universal, it can be in mathematics but not in literature, which leaves room for personal interpretation and understanding. According to Fabrice Hadjadj the real problem of our time is the delegation of transmission: in the past, knowledge was transmitted in a more traditional way, by the family, while today this role is often completely delegated to school, resulting in the loss of valuable lessons. The second problem we face nowadays is the excessive use of technology that prevents children to actually incorporate knowledge, which is best achieved through hand writing instead of using a computer. Régis Debray adds that indeed technology fragments and depersonalises, depriving pupils of personal, direct communication with the master. He concluded, "It takes a master to be freed from the master." Our pupils then asked a few pertinent questions to which both our guest responded. 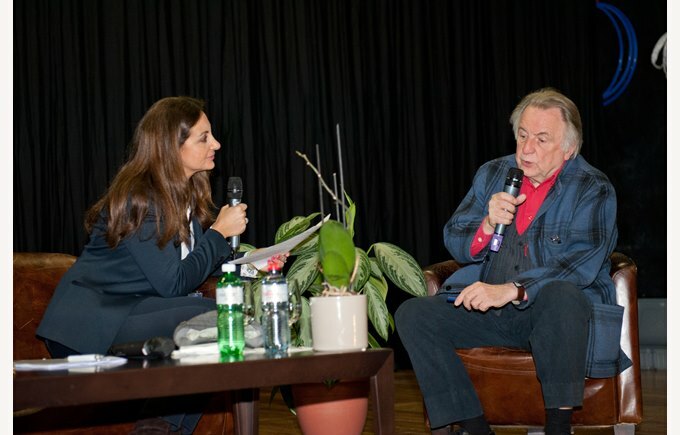 Following the questions from the audience, Maria Zufferey went back on stage for a personalised interview addressed to each speaker which enabled the audience to find out more about our guests. On these positive notes, the curtain fell and our 200 participants shared a lovely cocktail.